Critics and customers alike may have loved Lamborghini replacement to the Gallardo, but still the Huracán LP 610-4 came under fire for ‘lacking edge’. Can the new rear-wheel drive LP 580-2 change that? This is not going well. Before today’s shoot has even started, I’ve cracked my forehead off the doorframe whilst getting in. There’s a suspected slow puncture on our support car, which costs us 20 minutes early on, and as the day draws to a close, there’s a technical issue with photographer Arun‘s camera that hinders progress for another hour. Oh, and my heart is kicked into my throat by a moron in a Patrol that fails to slow for a roundabout and misses our test car by a layer of paint. I’ll refrain from mentioning the exact words I use, only that they rhyme with ‘cue trucking banker’. But more than all that, with a couple of hours already in the bag and only a few left to go, I’m struggling to like the Lamborghini Huracán LP 580-2. 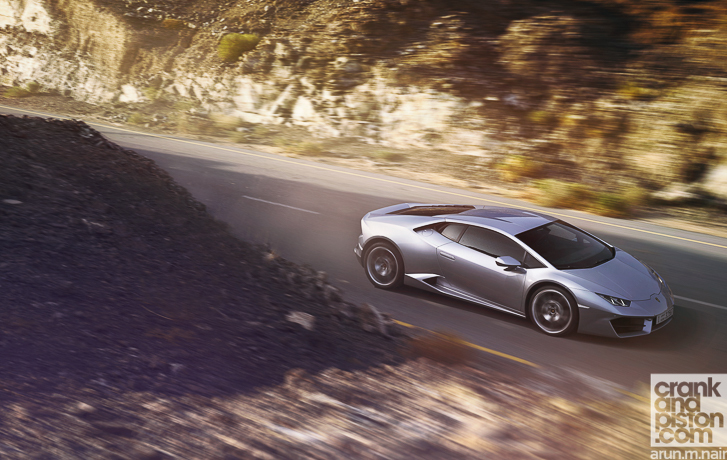 Let’s be honest, this is not the first time the Huracán has come under fire. Excited though we were back in 2013 by the prospect of a new baby Lamborghini, a new ‘benchmark for luxury super sports cars’ and a mid-engined V10 choking the chicken with 603bhp, still there was the question mark over whether Lamborghini’s new LP 610-4 would carry the success of its predecessor, the Gallardo recording the most sales of any Raging Bull in history after ten years of loyal service. Turns out it could, with better handling, acceleration, efficiency and reliability over its predecessor seeing the new Huracán rack up 3000 global sales in its first ten months, 600 more than the company’s previous best. And yet despite the financial clout, critics and $270K wielding customers alike found one major stumbling block. Sure, traction was incredible and the power delivery ungodly, but the all-wheel drive LP 610-4 would not oversteer. At all. Performance in the softest setting was impressive rather than scintillating, the Huracán as a result proving more predictable on the limit and less, well, Lamborghini. It was still a great supercar – that was never in doubt – but for a manufacturer famous for producing axe-wielding psychopaths, Lamborghini’s newest addition just felt too sensible. Cue the Huracán LP 580-2, specifically designed as a ‘serious car for serious drivers’ with a rear-wheel drive setup to promote both maximum driving fun and the ‘purest expression of Lamborghini to date’. Vindicated and yet burned simultaneously, Lambo was taking no chances this time around. Power being sent to just the rear axle helped shave 33kg of the Huracán’s kerb weight, 60 per cent of which is now distributed to the rear axle. 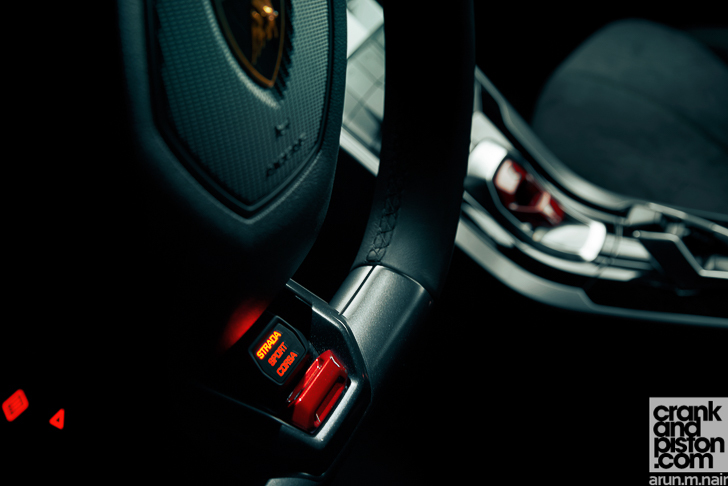 Stiffer suspension and a new steering setup was implemented for more precise handling, impressive enough given that the bonded aluminium chassis boasted double the torsional stiffness of the Gallardo. And while power from the V10 is now down from 603bhp to 572bhp and offers a whisker less torque, an initial spin in the LP580-2 on-track in Qatar earlier this year showed the new formula to be a belter and that all was once again well at Ferrucio’s house of business. And yet, I’m not feeling it. Granted we’ve yet to make our way into the mountains outside Fujairah – a new favourite section of driving road – but in the hour or two I’ve spent in the Huracán hot seat, the Lambo character is just not shining through. 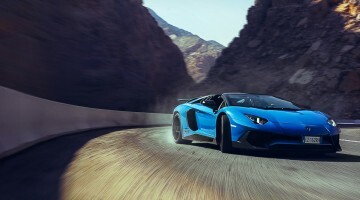 But before I dive into that section of the story which will have Lamborghini CEOs angrily reaching for Caps Lock, I’d first like to talk about the design. Since, quite simply, it’s stunning. In-keeping with the re-engineered RWD package, the LP 580-2 has also received subtle aerodynamic tweaks for what Lamborghini calls the ‘aesthetic of function’. Larger air intakes in the front bumper for instance direct airflow to improve downforce on the front axle, while a tail-lip spoiler and a renewed diffuser do likewise at the rear. To the casual observer, the differences are subtle, but there’s an elegance to the Huracán that truly allows it to stand head and shoulders above its competition: it may not boast the ‘violence in extremis’ touches of big sister Aventador, but nuances like the double bubble-esque roof, the folding bodywork around the windows, the intakes afore the rear wheel arches, and those super slick headlights nevertheless create an eye-popping look. It’s a truly gorgeous design that’s won me over immediately, especially the 19in ‘Kari’ alloys that leave me wistfully thinking about the Alfa Romeo 4C. The design is similarly striking on the inside too. Ducking beneath the door frame (this time) and sliding into the awaiting bucket seat, there’s an enveloping nature of the dashboard and the centre console that both looks and feels like a jet fighter cockpit: it’s a nauseating cliché we usually throw derisive snorts at in press and marketing material, but in the LP 580-2, Lamborghini nails it. The V10 can only be fired into life when a red metal guard is flicked up, akin to priming the weapon in a Godzilla movie. 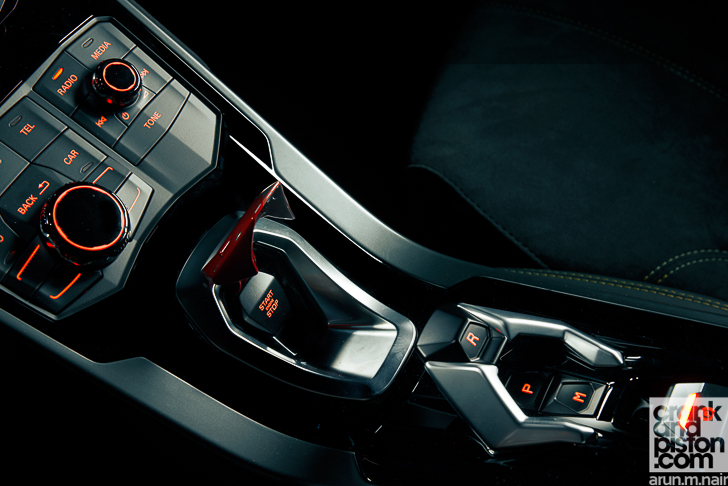 A row of toggle switches line the top of the centre console for the windows and traction control – surprise surprise, we’ve been asked to keep that on – while just above that lies a slim, hexagonal screen to gauge Olio, Temperatura and Batteria, Benzina (sorry, fuel) remaining on the infotainment screen before the driver. Push the honeycomb grille in front of the passenger seat and out pops a cupholder. There’s even shock green stitching on the seats and upholstery, a nod to the brake calipers that were NEARLY specced on our test model. It could be considered over the top. But this is a Lamborghini. It’s supposed to be outlandish, and dramatic, and, well, Italian. It’s what ultimately inspires me to flick said metal guard and press the stop/start button. Here’s where things start to go array though. Granted the engine note itself is almost alarmingly boisterous on start-up, a high timbred BRRRAAAAARRUUUUUMMM emanating from the quad exhaust before levelling out into more flat, metallic warble when ‘Strada’ on the ANIMA drive mode switch (Italian for ‘soul’, just F your I) on the steering wheel is selected. And yet, on the move and specifically on cruise, the energy of the lower gears is gone when you hit seventh, the metallic warble around the 2500rpm mark lacking its previous high-energy enthusiasm: it may slice any wind or road noise in two, but there’s only so much the stereo can fight. It’s also not the only Lamborghini flamboyance that is lost, leading to my earlier scepticism. Even despite stiffer double wishbones, the ride is surprisingly comfortable, although the seating position undoes much of the suspensions good work: I’ll admit that my six foot-plus physique is hardly the most appropriate for a supercar, but even so, the aggressive rake of the windscreen and the limited seat adjustment options means visibility is at a premium, both front and rear. This is not aided by an alcantara strip running the length of the centre console that manages to dig into my right knee throughout our journey. I’m also a little disappointed in the hard plastics found on the otherwise stylishly designed hexagonal air vents and infotainment system rotary dial, the less than helpful indicator switch on the ‘stalk-less’ steering wheel, and the slightly smaller than useful Infotainment System II touchscreen: often the reverse camera will be obstructed by the steering wheel itself. What’s truly concerning me though is the steering in ‘Strada’ mode. It’s almost unnervingly light and lacking feedback, so much so that – even on our opening highway run – I have to switch to ‘Sport’ mode for more tension through the steering column, a decision that fortunately doesn’t adversely affect the ride comfort. Even as we peel off the main drag though and begin the run into the mountains, my mind is less than relieved. Acceleration is rapid, the engine note raises a notch or two, and there’s a precision through the turns one would demand of an Italian performance machine? But where’s the enthusiasm? Where’s the serious car for serious drivers? Hell, where’s the Lamborghini? Screw it. I have only a few hours with the LP 580-2. Time to give it a kick, tighten the suspension, gearbox, acceleration and steering by 10 percent, and switch the soul to Corsa. 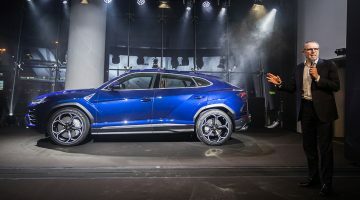 Lamborghini Urus. Interview with Lamborghini CEO, Stefano Domenicali.